The ComputerTown, USA! project started with Bob Albrecht and Ramon Zamora, friends who played tennis with the lead librarian at the Menlo Park Library, saying we want to put computers out for your patrons. A year or so after they started this, the National Science Foundation got wind of it and invited People’s Computer Company to submit a proposal to the National Science Foundation. Bob was always gathering groups of kids together to show them how to program and play computer games. He was involved with the Point Foundation (institutional home of Stewart Brand’s Whole Earth Catalog), Dymax, the publisher of People’s Computer Company newspaper, and the storefront computer center called People’s Computer Company. Putting microcomputers in libraries was an obvious next step. With NSF funding came the necessity to publish quarterly and annual reports in addition to the handouts needed for teaching in the library and helpful letters to other libraries, community centers and schools wanting to clone the ComputerTown concept. The LO*OP Center/HCLE archive contains the original NSF proposal that tells exactly what the grant funded, including the publication of the ComputerTown, USA! News Bulletin. As the 3-year grant period drew to a close, Julie Anton, Ramon, and Liza Loop gathered all this material together into a final report to the NSF. They then re-edited this material into a book for Reston publishers (then a subsidiary of Prentice-Hall) in 1979. Reston, which was already in financial trouble, printed the book but never marketed it (the cover price was an unfortunate $10.00) so the public never had an opportunity to buy it. When Reston went out of business in 1985, they offered the remainder stock to the authors at 75 cents each. Liza Loop bought 750 copies which are now available through LO*OP Center to the highest bidders (starting at $100 per copy). Book collectors have a few copies but the book is out-of-print. There is a copy of an earlier, shorter version in ERIC (see:https://eric.ed.gov/?q=Loop%2c+Liza&ft=on&id=ED224478). Liza took copies of the book to Moscow and Novosibirsk in 1987 when she visited computer clubs there. They were still on the shelves when she visited in 2001. The full book is available from Internet Archive’s Open Library, and anyone can download the ebook. A lot has changed in 35 years and it might be fun to revisit the ComputerTown concept with three questions: How accurate were Bob Albrecht and his team at predicting the future? What has changed in the communications and computing landscape to make ComputerTown no longer relevant? What elements of ComputerTown are still needed today? We recently completed a comparison of about two dozen software packages in an attempt to meet our museum’s needs for an asset, collection, and catalog management system. Catalog management systems provide ways to add and organize items, describe them with metadata, and make it easier to sort, search, and manage them as a series of collections. Our comparison included a make-versus-buy decision because we have also been developing a custom software solution internally called the Catalog Maintenance System. Our decision-making process is presented as a case study describing how we assessed various commercially available solutions, our selection criteria, and our tentative decision. Hopefully, our experience will be useful to other museums and similar organizations. A good catalog management software solution is especially important to a virtual museum, like HCLE . Almost every museum, library, archive, and collection needs some way to keep track of its artifacts, objects, individual people, organizations, and other information. Staff members need to manage the items. Researchers need it to make discoveries and reveal connections. Contributors, enthusiasts, and the generally curious use it to follow up on items they encounter while browsing. Managing any significant number of items while making them publicly available would be incredibly inefficient without a catalog. Since a virtual museum contains only information, without actual artifacts to manipulate, the catalog is the only way to access its content other than browsing through items one by one. Unfortunately there is no generally accepted standard for cataloging digital artifacts. At first that was a disappointment; but, we quickly realized we shouldn’t be surprised. Each repository is distinguished by its purpose; each collection answers a different question and requires unique ways to discover its contents. We are creating a virtual museum for the study of the history of computing in learning and education; basically, a repository of an era when we learned a new way to support learning. In addition to physical artifacts –books and hardware (like the first Apple 1, and a Radio Shack TRS-80 that includes an actual mouse that decided to live inside the chassis while the computer was in storage) — we have executable software stored on a wide variety of disks, tapes, and drives, an expanding set of ‘born-digital’ oral histories, and internet links to other repositories. Most providers of cataloging software distinguish themselves on how they handle tracking, describing and exhibiting physical objects (in buildings and online). They were not designed to meet HCLE’s needs. We started with a simple spreadsheet but it proved insufficient for both data entry and item searches by staff. We then went to a Microsoft Access database. This worked for a small number of items (under 500) but we were concerned that Access wouldn’t scale well as we increased the collection to many thousands. Also, it didn’t offer an adequate web interface. For the collection to be made viewable online by the public another layer of software would be necessary. Also, we want visitors to be able to interact with the all the information we have about an item (the metadata), not just a brief description of a displayed image. This requires a very sophisticated user interface. Fortunately, our founder, Liza Loop, has a long history of thinking in terms of databases, knows the collection intimately, and has a vision of how the eventual virtual museum will operate – a good set of perspectives from which to properly define an efficient system. With that background, we set upon the task of writing custom software to meet our custom needs. We didn’t think it would be easy, but it could be worth the effort. This task has proved challenging. We were not, however, able to open our Catalog Maintenance System to the public – at least, not yet. Using our incomplete software requires lots of instruction, training, and support. We have not yet created a feature to limit permissions to ‘read-only’ access. And, it’s not pretty. While it looks fine to us, the interface needs better graphic design. Several other features like image gallery support and cross-platform functionality are also achievable additions; but we are in danger of being trapped by feature creep. While part-time and volunteer efforts can achieve remarkable things, we are aware of the full scale of the task and our growing list of targets. Development of this software is also distracting us from the primary goals of digitizing the artifacts, cataloging the collection, and making a preliminary version of the museum available to researchers. It’s a question of resource allocation: what is the best way to spend our time and money to reach the museum’s goals? We have proven we can eventually build a viable system, but our main goal is to create a museum, not to write software. Would it be quicker, cheaper and sufficiently efficient to buy or license existing software? We are embarked on a make versus buy process. Thanks to attending a few conferences and seminars we were able to create a list of vendors and user anecdotes. Brochures are always encouraging; that’s their goal. Anecdotes ranged from encouraging to discouraging. Available solutions dramatically improve many museums’ efforts, but the general consensus is that there is, as yet, no generally accepted solution. Each software package has advantages and disadvantages, and almost always requires compromises. The majority of features are useful, but most users experience some need for customization. Sometimes the customization is formal and managed with contracts and expenditures. Sometimes the customization is internal and managed by creative uses of the existing features and fields. Our selection will require more than just checking the price tags. Our initial list included about two dozen vendors, plus our internal Catalog Maintenance System. Each vendor was presented with a request for quote and was provided with an overview of our situation. Here’s our template for the initial communication. Please provide a quote for the purchase and use of your software and services. We are a new, small virtual museum currently developing a digital repository, catalog of artifacts, documents, media, and online exhibits. We have an in-house catalog maintenance system, but are interested in understanding the costs and benefits of your offering. an indefinite number of digital exhibits that will be linked to our and other collections. Currently, a few dozen items have been entered into our MySQL database and in-house catalog. Access is available upon request if it would help produce a better quote. Include prices for support services such as hosting, customization, porting, training, and real-time help. Our goal is to create a virtual museum for the history of computing in learning and education. This catalog will be essential to the subsequent research and the development of exhibits. Feel free to contact us for any clarifications. Before we sent out the query we established a common set of criteria for an initial assessment based upon whether they could accommodate our scope, the pricing mentioned in the query, but also including the ability to import and export all metadata, database structure (if any), and whether their software was open-source. This exercise was quickly instructive. While we asked for quotes broken into specific categories, vendors’ internal business processes dictated a variety of responses. Our spreadsheet became very messy very quickly. Direct comparisons were difficult. Some lessons and distinctions were immediately apparent. Major expense drivers included self-hosted versus cloud-hosted, commercial versus open-source, and data migration fees. A self-hosted, open-source system was closest to our custom system and therefore initially appeared to be the most cost-effective for our processes. However, paying for hardware, software adaptation and ongoing, local administrative staff dramatically increases the recurring costs of open-source solutions. Commercial software is usually more expensive at the outset, but it also tends to include more functionality, though less customization. Data migration expenses were a surprise. Each company advertises that migration will be easy, but that claim is based on an assumption that your existing data is already internally consistent, well-organized and can be mapped directly into the categories available in the new software. The cost of labor to ‘normalize’ or clean up an existing catalog must be incurred regardless of whether the new system is made or bought. Dozens of emails, phone calls, and online meetings were necessary to understand the various responses from vendors. Ideally, each communication would work from a standard script, but that was impractical. The vendors are competitors, and each made points that could be countered by another. We could have ended up in an infinite loop just trying to acquire a consistent set of questions and answers from all involved. We had to make judgments which also meant some mistakes and oversights. Taking all of those insights and then strictly assessing our internal efforts was challenging. It’s difficult to be dispassionate when you know the people who put their passion into the work. Vendors do just as much work, but it is human nature to pay more attention to established relationships. After much spreadsheet manipulation, we collected the cost estimates into four primary cost categories: non-recurring, first year costs, costs through three years, and costs through five years. As with most non-profits, we are sensitive to the initial costs such as initiation, training, and migration fees. First year costs included recurring licensing and hosting fees. A three year cost point was important because, according to our project-wide plan, we will reach almost full operation in about three years. (Catalog software is only one of the tasks necessary to enable our virtual museum.) Five year costs are a measure of sustainability, and an acceptance that three year plans frequently become five year plans because of schedule slides. The initial sort resulted in nine candidates for the next phase: our internally-developed software, plus eight other cloud-hosted products. These had reasonable costs and met most or all of our initial technical criteria. We assumed that we would do as much of the data migration as possible with our own volunteer staff rather than paying for vendor consultants. This reduces non-recurring cost while accepting that it will increase the time required for the migration. We also decided that vendor-hosting was safer and less expensive than managing our own servers or buying external hosting. Next we delved into more detailed procedural and technical discussions. While it would be very informative to query all of the initial candidates with a full set of questions, it would have cost too much in time and money. We chose to reserve the deeper discussions for the smaller set of candidates. We sent them a list of questions to prepare them for the next, and possibly final, sort. Human communications are never perfect, and we realized that we needed some clarification. While we thought our initial communication described where we are and where we want to go, the format of the text emphasized the future — where we want to go and the capacity we expect a system to accommodate after we’ve grown. Evidently, some vendors missed our description of our current situation. The more immediate requirements were far simpler, and influenced estimates of non-recurring items like storage requirements and the number of users. We hoped to make that clarification as well as present the expanded list of criteria. Here is a portion of the second communication. Our current situation is simpler because we have fewer than 1,000 items in our existing database. This is a need for metadata normalization, and we are assessing the size of that task. For the detailed technical discussion and any updates to the estimates (particularly for data migration) we have included a set of topics. Several more emails, phone calls, and online meetings occurred. Online meetings, often attended by both of us, included interactive demonstrations of the standard software. Every system we reviewed demonstrated had an impressive set of features. If they didn’t, they wouldn’t be in business. Each had slightly different sets of features, pricing strategies, customer support approaches, and communication styles. As we learned more, we also realized we might use one solution for two problems. Several of the systems included CRM functionality. (Pick your favorite variation on the C –Constituent, Contact, Client, or Customer; RM stands for Relationship Management.) Currently, we are using CiviCRM but have yet to master it. Ideally, a CRM system would enable tracking of communications, grant proposals, and would reveal connections among individuals and their institutional affiliations. Realistically, we continue to rely on Gmail and spreadsheets while CiviCRM primarily acts as a massive address book until we can learn how best to use it. Because of the nature of our virtual museum, a person could be represented in our Catalog and in our CRM. This is true of many museums dealing with artifacts created by living artists or inventors. For our museum, the same person might be a volunteer, artifact donor, fundraiser, financial donor, researcher, author, exhibit creator, and subject of an exhibit. We need to track current names, addresses and contact information for such individuals as well as their relationship to items in the museum. Putting those two functions into one solution has an obvious appeal and value. Every museum, library, archive, and collection will probably find similar synergies, as well as finding deficiencies. One of our primary concerns is the ability to use our custom and extensive metadata set to associate previously unconnected items in the catalog. At the same time, we want to track their physical and digital locations from initial intake through possible deaccession. We are a virtual museum and we plan to deaccession most of our physical artifacts to permanent repositories; but there will always be items in the active intake process. We also have artifacts that are only digital: e.g. permanent universal resource locators (PURLs) of related items, copies of born-digital items, and whole books available online through public libraries. We intend to make full text searches available across and inside of each artifact so a researcher investigating a text string will find items with the text string in the title, or in the body of the text, or in the metadata, or within our CRM database. After reviewing the answers to our queries and updating the spreadsheet, we were better able to compare the commercially available solutions to our internal solution. Three key issues became apparent about creating a custom software package, time and money. No surprise, there. Also, no commercial product will fulfill all of our desired functions on our wish list. Compromises will be necessary. Our next step is to try out the most promising commercial candidate, Collector Systems, and compare its performance with our internal ‘make’ effort, the Catalog Maintenance System. The money issue was described above. Custom software can be very affordable with volunteer efforts. Unfortunately, custom software benefits most from local hosting, which benefits most from hiring dedicated system administrators. Volunteers can build impressive software, but to make a system sustainable it is necessary to have a persistent staff. Volunteers donate their time, effort, and energy but they are also free to volunteer elsewhere as their interests or life situations shift. Besides, programmers are in great demand and we would be surprised if each of them weren’t eventually hired away. If we hire our volunteers, even for part time work, they will still be more expensive than the initial purchase price of many of the commercial packages. That expense became much more apparent when comparing three year accumulated expenses. The time issue has several components: design time, programming time, management overhead, documentation time and training time. Even with a dedicated volunteer programming crew, someone has to manage their efforts, and spend time training the rest of the staff. It is a lot to expect of programmers to ask them also to be designers, documenters and teachers. As a small museum, we must manage our time carefully. Our goal is to properly steward the collection and enable research. Managing software could easily overwhelm that central task. Another time issue is the urgency imposed by the age of the people involved in the history. Pioneers who brought computers and computing into teaching and learning environments in the sixties are necessarily past middle age. Every day, more stories and insights are lost. Artifacts are discarded by those who think no one cares, or by those who don’t know the value of what a previous generation collected. The more time we spend developing software, the more likely we are to lose valuable bits of history. It has been a difficult decision to set aside, at least temporarily, the system we developed. By choosing a commercial package, however, we may save significant money and time. “May” reflects that any such choice is always made with educated guesses at best. Perhaps our internal software is just on the cusp of being fully functional, something we can share with the community. Maybe we are years from completion. Maybe the transition to another system will take longer and cost more than we expect. Maybe using an existing solution will provide opportunities we are otherwise missing. There is no way to test a new catalog system except to load in some sample data and see how it performs. We have decided to conduct an in-depth test and trial of Collector Systems, a cloud-based collection management system. As described above, a key distinguishing feature was being cloud-based. Cloud-based systems dramatically decreased our system administration costs. We recognize that nothing is free, and that there will be a need and a cost associated with managing the management software; but, that’s a baseline all options were burdened with. As a small museum, we are very sensitive to costs; so, being able to effectively scale from a single user also reduced our costs. Scalability appears to be manageable with each new user and on a monthly basis. The feature set covers most of our key criteria. We want to be able to create galleries of the images and files, view extensive metadata, conduct searches within the database, and do so in a simple, yet powerful interface. At this point, almost every vendor could say they could provide the same function; and they’re probably right. As we described above, if they couldn’t, they wouldn’t be in business. Costs are objective criteria. Feature sets are also measured against objective criteria, frequently as a pass/fail; but feature sets also are measured against subjective criteria. A menu, navigation strategy, visual interface, or data import and export scheme may be intuitive for some, but not for others. We’ve familiar with the history of how people use computers; in cases like this, we are familiar with the importance of how hard or easy it is to learn and use a new system. The progression from Altair, to Apple 1, to IBM PC, to Macintosh, up through smartphones isn’t just about processing power. Apple’s operating system is cheered as intuitive, but that is not universal. While it would be ideal to test every system to the same depth, we can’t afford that luxury. But, we must test, which is why it is important for us to test a system in a way that is affordable that can also lead to migration and implementation. We won’t know whether this is our solution until we’ve tried learning their software, incorporating our metadata, and migrating several items. Our trial of Collector Systems is just beginning. We will report news as appropriate – and as we have time. We have a lot of work to do. Picking a good catalog management system enables our current critical path task. Hopefully, we reach our goal more quickly and with lower costs. Conducting such a survey is not free. The representatives freely offered impressive amounts of time to guide us, but we did experience internal labor charges to manage the survey. The survey cost about $800 and took about four months. The survey wasn’t the only charge or the only task, but it was a significant effort considering the size of our organization. The benefit of conducting the survey is a potential cost savings of $300,000 over three years, with additional recurring savings that increases our sustainability. We also are potentially shortening our program plan by several months, and possibly as much as a year. The cost/benefit ratio is therefore about $300,000/$800 or $375 of benefit for every dollar spent. If you prefer, the reciprocal is a cost of 0.267%. The survey would not have been possible without an internal willingness to face difficult internal reviews. The survey would not have been possible without an external willingness to educate us without compensation. Properly wording the communications to the vendors who weren’t chosen was difficult because their efforts are so deeply appreciated. Such surveys, however, only result in one answer; so, only one yes was delivered. Thanks to everyone else for their time. Now begins the real work of learning, training, and exploring the software; while ultimately returning to the task of building our virtual museum for the history of computing in learning and education. Our urgency persists. The passion and confusion within the Educational Technology industry demonstrates a demand for understanding how to improve students’ learning. We are all students: kids in classrooms, employees at work, anyone who found that their computer had an upgrade overnight. Computers and computing have dramatically changed the need and the style of learning and education throughout our society. We intend to supply some of the insights needed. But first, we have to figure out how to log in to Collector Systems. There are gaps in history, eras when important things happened but no one properly preserved the records. If you study history, you probably have your favorite examples of mysteries that will only be resolved with a time machine – or a very lucky find. The history of education is facing such a blank space. Within the last decade, conversations about #EdTech have been accelerating and expanding. More material is being produced than anyone can assimilate. The born-digital portion of the discourse is impressive. Even the research, analyses, and insights being developed today aren’t always archived correctly; but academic studies are more likely to be preserved by their institutions, unofficial but effective efforts like Internet Archive save many of the web sites, and popular press collections by journalists, bloggers, and commenters are more likely to be preserved (at least temporarily) by whoever hosts them. Today, born-digital means easily transferable, and possibly preserved. The decades before the Internet became a common (and largely chaotic) depository for all of human information weren’t so fortunate. It was an era that started with discussions about students possibly being interested in getting jobs that would develop computers, up through the period when computers dominated classrooms but were largely constrained within the walls of the schools. It was an era that had governmental and institutional initiatives; but it was dominated by pioneering teachers, administrators, and students who didn’t wait for official approval to expand what, why, how, when, and where they taught and learned. Compared to today, there was far less material produced, which means each artifact is that much more valuable. We at HCLE (the History of Computing in Learning and Education Virtual Museum) are focused on that era and those people, and are surprised that we can find few others doing similar work. The teachers, administrators, parents, and students then asked the same questions being asked today. How much screen time is appropriate? What lessons are best taught by the teacher lecturing versus the student exploring software? Does the cost of technology create a digital divide based on wealth? EdTech’s historical gap is filled with insights and answers that apply to questions today. EdTech’s blank space exists because the pioneers who didn’t wait for approval also didn’t necessarily document their intent or process. Sometimes it was unintentional, because the pioneers were so busy pioneering that they postponed documenting their progress. Sometimes that was intentional, because official records could trigger official demands to cease and desist. The documents that were produced were usually printed on non-archival paper. They are perishing through age and neglect. The hardware is becoming more fragile, and possibly impossible to repair because of the lack of replacement parts. The software is being lost because it was stored on a variety of media, some of which are degrading quickly, some of which are orphaned because the hardware readers are no longer available, some of which are orphaned because the operating systems no longer operate, and some of which might work but no one remembers how to run the programs. The most valuable and ultimately most perishable information are the stories stored in people’s memories; the true source of the research, analysis, insights, and wisdom that may or may not have been documented elsewhere. The loss of artifacts and first hand accounts is not unique to our museum. Any museum that is working with the history of a topic from the fifties through the nineties experiences the same urgency. Change in society is accelerating, but today’s efforts are more likely to be born-digital in an era when the awareness of preserving the information is being discussed. The efforts of decades ago didn’t benefit from the preservation efforts; yet, those efforts were the enablers of today’s acceleration. Change requires adaptation and learning. A hundred years ago there was change; but a person could learn skills that would be useful for decades. Very little retraining was required. It was the era of lifelong careers. If you needed or wanted to learn something new, you found a class and learned from the teacher. Today, the skills you learned to operate your computer, your phone, your car, and your appliances may become outdated with the next overnight update. If you need or want to learn how to use the new version, you expect to teach yourself, possibly by communicating with peers. We’ve become less reliant on authority figures and more reliant on ourselves and our community, online or offline. Understanding how we adapt to change is becoming more important because change is accelerating and adaption becoming more necessary. And yet, the history of our adaptations to one of our most important changes is being lost. Civilization was enabled by education. What, why, how, when, and where is largely different from a hundred years ago, and even fifty years ago. Our civilization is entering a new era that is dramatically different from the previous era. Between the two was a transitional era, an enabling time that is easy to ignore, overlook, and even throw away. We are working to defend against the growth of that blank space in our history, to save enough of the artifacts and first-hand accounts to tie the eras together, to document a time when change accelerated – a useful study considering how understanding change will be necessary for understanding our civilization. If you’re doing the same, great! Thanks for doing what you do, and thanks to everyone who is helping. Games have been part of education because children like games. Adults do too, but they’re more likely to find a different motivation to learn, and may be so careful about appearances that they’d play. Oregon Trail, as we’ve written about before, is one of the best examples of how computer games teach different things depending on how the game is played. While each player will always learn differently, the distinction goes deeper because computers and computing are always different. The game teaches about the lives of the pioneers on the trail, but it also teaches critical thinking, strategy, and the influence of chance. Oregon Trail started with a version that required the player to type in the code. Regardless of the history lessons, the player had to learn something about programming. The power of a typo in code could be readily apparent, and make the game easier, harder, or simply bizarre. Shift a decimal point and the buffaloes can grow enough to feed the entire wagon trail, or so shrink to the size of squirrels, or defy logic. As storable memory became available, the code may only have to be typed in once, which teaches some programming, and delivers the awareness of the underlying code, but eventually subsequent games and players can ignore the computer and computing and concentrate on the game and its lessons. The user’s manual for the apple II version (thanks to Internet Archive – and note yet another spelling of Apple II) even included the basis of math model so players would maintain some understanding of the game’s math, systems, simulation requirements, and data sources. Assumptions are explicit. When software was delivered on disks, assumptions became implicit. The game could be played without learning about the programming limitations and requirements. Math models are only witnessed by their products, not because the equations are displayed. As graphics improved, the nature of the play turned from keyboard commands in the 1990 version to point, click, and shoot in the 1992 version. The visuals emphasized entertainment rather than intellectual complexity. Thanks to Internet Archive we can pull together a few of these versions for comparisons. The game continues. Houghton Mifflin Harcourt continues to sell the game in yet new incarnations. The learning continues. 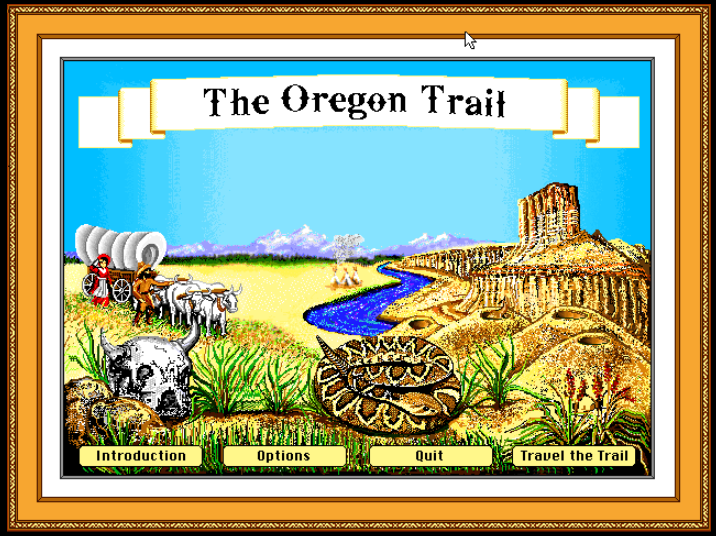 Oregon Trail is one of the easiest games to use as an example because it has spanned the various computer eras. Other examples are more complex. Flight simulators have existed almost since the beginning of flight. The professional versions advanced outside public access. The home versions were toys to start, but now have advanced into valuable tools. Oregon Trail, simulators, and others are opportunities for us to study how computers and computing affect learning and education. EdTech is a popular and profitable topic yet considering the impact of computers and computing on our society, very little has been done to study which level of technology is best for specific aspects of learning. Our goal is to create an online space where such questions can be asked and answered. The size of the task is typified by the size of the game and simulation industries. There’s a lot of work to do, but first, of course, we have to make sure the games are playable. We know what we need to do. But how do we describe it so others understand (and fund) the work? 2013 and 2014 are when HCLE has been building the framework for the construction of the Virtual Museum. General plans are in place. Initial collaborations have begun. Our network is extending into all the necessary fields: humanities, history, education, computing, computers, curation, preservation, exhibits, etc. Now the details begin to reveal themselves. HCLE is applying for an NEH (National Endowment for the Humanities) Preservation Assessment Grant. (HCLE > NEH PAG – Maybe we all need shorter names.) Our first step is straightforward to us: get the right help to steer us to the best way to turn a collection into a widely-accessible digital repository. Every collection starts with a bit of chaos. Now is when we put some order to the informalities. Here’s our draft abstract. You are welcome to comment. The target collection is an historical record of the introduction of computing into teaching/learning environments from the early 1960s to 1990. It comprises documents (publications, correspondence, notes, manuals, product inserts, etc. ), software (printed listings, paper tape, magnetic tape, audio cassette tape, various floppy disk formats), hardware (mini- and micro-computers and peripherals), and recorded conferences and interviews (multiple formats). The goal is stabilizing, preserving and inventorying educational software and supporting documents used in teaching of the humanities. In the case of historic software, transferring software from historical to modern media is not a simple case of reformatting; it is preservation because a) the original magnetic media will degrade and b) devices capable of accessing the software from original media are rapidly becoming unavailable. Creating a digital repository sounds simple, but it only stays that way if every artifact is like the rest. Hundreds of copies of a magazine can all be processed the same way as one. Our collection is a mix of documents, software, and hardware. The documents exist as newsprint, mimeographs, dot matrix, hand-written notes, instructions on the backs of boxes, etc. The software is on such a diverse media that we may find that no one has a complete collection of drives and readers; and then, some of the software is stored as printed text that must be typed in. Error checking may require proper emulation environments to make sure each program operates properly. (And then someone has to play the games to make sure they work.) The hardware was usually designed to only last a few years. Obsolescence wasn’t planned. Technology changed so quickly that everything was effectively obsolete as soon as it was available for sale. We plan to hire a consultant to provide a professional opinion, and as usual be very grateful to our volunteers. While this may seem like a small task, it is a necessary one that will enable the very existence of our Virtual Museum. These are exciting times for our (currently) small museum. Thanks for being a part of it, even as a spectator.